A comprehensive study of the history of the Irish Republican Brotherhood from its roots in the European revolutionary tradition of the 1840s, to the emergence of Sinn Fein in the early 20th Century. Reconstructing the history of a secret society is necessarily a difficult task, but McGee's account is compelling. He shifts the emphasis away from the insurrectionary attempts of the 1860s, which were partly shaped by pressure from the movement's Irish-American supporters. Instead he focuses on the 1880s, the IRB's role in the Land League and as a competitor to the Irish Party during the home rule debates. He sees the IRB primarily as a political movement for democracy in an age when democracy was still a revolutionary idea. 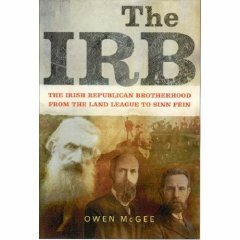 If McGee sees the IRB as key to Ireland's break with Britain's elitist constitutional tradition, he nevertheless sees its republicanism as distinct from the more Catholic-influenced Irish-Ireland ideas of the War of Independence generation, and of the legitimism of the post-Civil War IRA. This book will be of profound interest to any serious student of modern Irish nationalism.